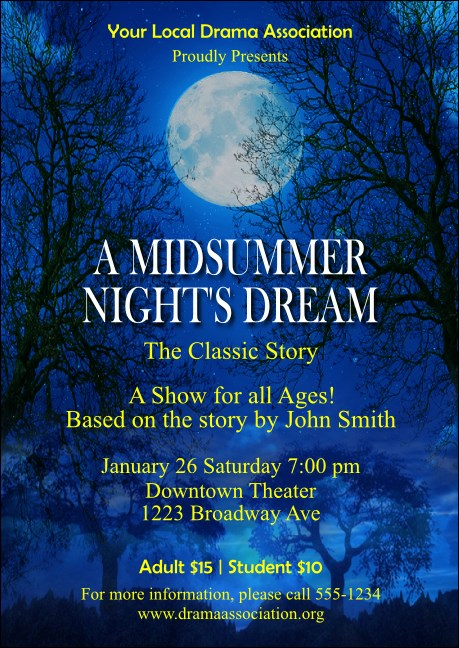 Enchant everyone on your guest list into buying tickets to your theatrical performance with the Midsummer Night's Dream Postcard Mailer! A full moon sheds cool light in this template’s background and lends a glow to your show details. Once customized, we’ll print in bewitching color and mail to your contacts via USPS First-Class Mail. Fill your theatre with friends, family, and fans! Find the perfect, executing postcard design for your needs on TicketPrinting.com.